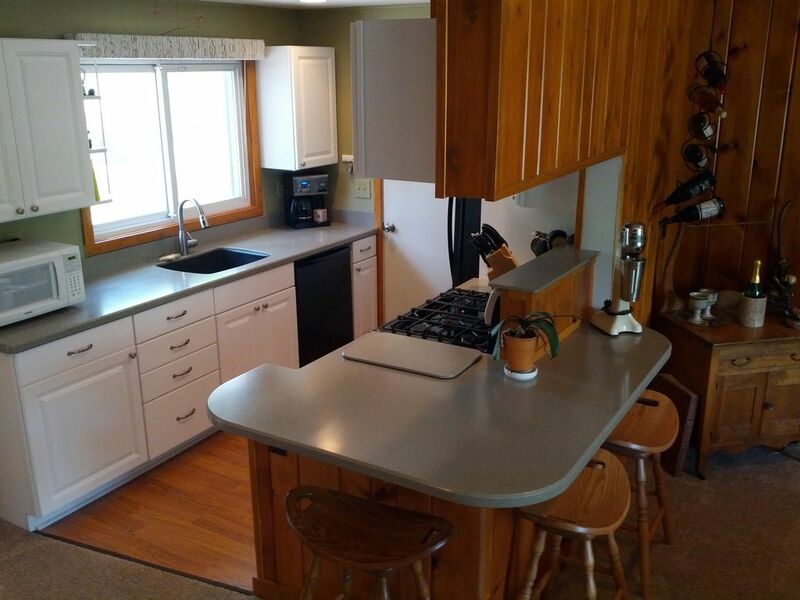 All the comforts of home and close proximity to all the fun in Leelanau County. Our cozy, air conditioned home offers you 2 bedrooms (full size bed in one, queen size bed in the other) and an air pillow sofa bed for up to 6 guests at a time. You will love the tiled bathroom, open kitchen area with garbage disposal and dishwasher, and having laundry facilities. The main living area offers a 50" plasma HDTV using DirecTV, Charter internet, and floor to ceiling bookcases filled with books, DVDs and CDs. The back yard patio is the perfect place for you to roast marshmallows in the free-standing fire pit, grill a yummy barbecue or enjoy a morning coffee while you relax and plan your next adventure in Leelanau County. We, Carol and Jim Ashmore, are excited to be opening our home to you. Carol was born and raised in Traverse City while Jim came from Stockbridge. For over 30 years we lived and worked down state. Returning to Leelanau County and being able to live here have been a dream come true for us. Against the Wind is our personal residence from November 1st to May 1st of the year. In May we vacate the house for our summer guests. ATW also has a year round rental, with a separate entrance and separate driveway on the lower level of the house. Our tenant is a young woman from England. In two reviews a guest said they heard faint noises from the lower level, but nothing that would prevent them from renting from us again. Personally, lower level noise has never been a problem. When we renovated ATW we made special efforts to sound proof the house as much as possible. Family roots and a deep appreciation for the beautiful natural landscape of the area have always been a magnet for us. Carol's family has been in Leelanau County since the mid-1800's. Her mother was born and raised in Northport. Many of her cousins still live in the area. We enjoy walking the many beaches, swimming and looking for Petoskey stones, riding our bikes and sometimes just going for a ride. There is no other place we want to call home! We're sure you will enjoy the morning sun streaming in the living room window and the evening sun warming the back yard patio. Within walking distance you will find the friendly community of Lake Leelanau with three very different places to eat, a distillery, a winery, a coffee shop and a pastry shop. Nearby Suttons Bay offers a lovely cinema and unique shopping. Historic Fishtown on Lake Michigan is a five mile drive to Leland. Traverse City, with all it offers the vacationer, is only 20 miles away. Perhaps you would like a day trip to the Sleeping Bear Dunes National Lakeshore in Glen Arbor or an evening outing in Peshawbestown at the Leelanau Sands Casino. Our central location gives you a multitude of options, all close to home. And when you return home from your day's adventures, you will feel the comfort and relaxation that only home can give you. Located in the village of Lake Leelanau. House phone for your use. You will need your own beach towels. Second refridgerator available in laundry area. Newly redone kitchen has new appliances and opens into both dining and living areas. Beautiful oak dining room table plus kitchen countertop bar seats 3. Wide range of books including children's books. Board games and puzzles available. No ramp, but only 2 steps to main floor. We enjoyed the peacefulness of the location. The home is well stocked with all the amenities you would want and more. The hosts have all the information about everything in the surrounding area. Truly a great place to stay. You are centrally located. The house was perfect for us. Very clean and very comfortable. It has everything you need. We loved staying here. The property has generous provision of grocery and toiletry items in addition to comfortable and well equipped accommodation. It is ideally situated for discovering the delights of the Leelanau Peninsula. The owner is very welcoming and helpful. We very much enjoyed our stay. I ended up seeing much more of the surrounding burgs than spending a lot of time in Traverse City because of the location, and I'm glad for that. This house is so comfortable, it was hard to leave it, but a joy to come home to each evening. The. Hosts think of every thing a guest could need, but once they orient guests to the property , they respect your privacy yet are just down the road if there is an unanticipated need. The home is sweetly and artistically decorated. I especially appreciated the popcorn maker. And its located near so many interesting places. It made a great home base. I wish I'd been able to stay longer. The owners were great! We all had a great time the house was awesome..
We stayed at the home with our children for a few days and could not have been happier. Our hosts met us and took us through the home when we arrived. They have literally thought of everything a family could need. The house feels like home (just a bit more organized!) - in lieu of a rental. Beyond well stocked with every staple, piece of equipment, instructions, suggestions you could imagine. It was decorated super cute, immaculately clean and inviting. The location was great and close to many local attractions. Highly recommended. Rates are subject to change until the reservation is final.